M's parents took a trip to China for a tour. On their way back towards San Francisco, they stopped in Tokyo for a few days to visit us. We had a great time showing them around our neighborhood and the city. They weren't here nearly long enough to see everything in the city, but they got a good flavor. We took a walk to the Meiji shrine (largest in Tokyo, I think), strolled the Omotesando fashion district (with Cartier, Armani, and Ralph Lauren), went chopstick and used kimono shopping, saw some antiques including a 200 year old bento set ($2500), had tea at a teahouse on an island in the middle of a pond in a beautiful Japanese garden, saw a graceful 300 year old pine tree, visited the Tokyo-Edo museum (history of the city), walked around University of Tokyo (including its beautiful pond and garden), went to the kabuki theater to see a terribly tragic but wonderfully performed play (with wireless earpieces that broadcast translation and interpretation in English to one ear so that you can both enjoy the show and follow what is happening), and walked around the Imperial palace and its gardens (though the palace itself is off limits to visitors). Plus, we sampled lots of great Japanese food! We really enjoyed having visitors, and we hope others will come along to see us soon as well! M's parents got a discount on the park hyatt hotel in Shinjuku. It's the hotel featured in the movie Lost in Translation. We enjoyed touring the hotel, playing with the automatic curtains, and recognizing various spots that appeared in the movie. When you visit us, you can consider staying there, or try out our pull-out sofa bed. Last night, we had an unexpected knock on our door. It was our downstairs neighbors (and landlords). They asked, "Do you like Japanese food?" in English. I replied in Japanese that we loved Japanese food. They said, "please wait five minutes." In a few minutes, there was another knock on the door and there was Takahashi-san with a beautiful tray of food for us to eat. You may have noticed that the site has been down for the last two weeks. Sorry about that. We just switched servers and that should correct the problem. Our old entries won't be transferred for a few days at least (when we get the time). But, we've got a lot of fun stories to add between now and then! Commuting is a central part of life in Tokyo. It is rare to meet people whose commute is less than an hour. Mine clocks in at about 50-55 minutes, so I am among the lucky ones. My commute starts at our kitchen door. I head down the stairs and sit on our a small wooden stool and put my shoes on. I head out the door, open up our mailbox and grab the copy of "The Daily Yomiuri", our English language morning newspaper, and head towards the train station. I pass by the crossing guard who is helping school children avoid hazards from the apartment building currently under rennovation on the corner. He is pretty much the only person that I have seen that makes eye contact on the street or says hello -- I think that's partly a Japanese thing and partly just a feature of being in a big city. I walk up a short hill on some very quiet residential streets. The main street with shops and restaurants in our neighborhood is closed to vehicles in the morning from 7:30 - 9 because there are so many people (adults and children) walking to work and school. The businesses don't tend to open until after 9, but almost none of them have posted hours of operation. I walk past a tea store, two drug stores, a Dominoes pizza, a produce market, a convenience store, a bagel shop (it does have hours, though they are ridiculous for a bagel shop -- 11 am to 6 pm), and a handful of restaurants. I cross a more major road and then travel down another street that is so narrow and steep that I once saw a taxi driver backing up it because he couldn't fit through, and taxi drivers are known for their skill of navigating narrow corridors. Nonetheless, there are houses with cars parked along the street. Unlike many American train/subway stations which are out of the way or surrounded by parking lots, train stations here are the hub of activity (it was still early when I snapped these photos, so it looks dead both outside and inside the station). I breeze through the crowds pasts the stores and head to the electronic fare gates and insert my 6 month commuter pass. It gets me unlimited rides from home to the station near my work for 6 months ($450). I have figured out exactly where to stand so that I can be close to the station exit on the other end. If you are at the wrong end of the platform, it can take a full five minutes to make your way to the station exit -- partly because trains are long and partly because of the crowds on the platform are all clamoring to reach a single exit. I usually step onto a train about 10 minutes after stepping out the door of our house. We live at the transfer point between two lines, so when an express train from one line pulls in to the station, people flood out the doors and race to the opposite side of the platform where they vie to be first in line for the next train on the other side. Being first means getting a seat. My train line is the one they are dashing for. My station is the starting point for the line, so we always start with a completely empty train, but it's almost hard to find a place to stand by the time the doors close a few moments later. Some people line up and wait for the next train so that they can be first, rather than try to cram into an already crowded train. Despite the fact that enough people get off the express train to completely fill my train to capacity, I still watch as the men in white gloves help force the doors closed on the express train because it is bursting at the seems. It must be something like a Volkswagen. On the train, I usually read my newspaper, a book, or listen to podcasts that I download to my cell phone/MP3 player/camera/GPS/web browser. The ride lasts about 30 minutes, but most people get off at one of the major Tokyo downtown stations after 15 minutes or so. Once, I was sitting on a crowded car and literally everyone in the car left at a single stop, leaving me alone. I was worried that something was happening to the train, but it carried on like normal and dropped me at my stop a few minutes later. I now look forward to the luxurious space and quiet after that stop. The station at the University has a sign that says, "Beware of heavy winds caused by trains." The station clearly has some sort of design flaw because I almost got blown over once when I was near the entrance as a train pulled into the underground station. It also means that my hair will get blown wildly at this point in the commute, so I have given up attempting to comb it prior to this stage of the morning. I have another 10 minute walk from the station to the University campus. It's also pleasant as I pass by a school, a park with play structure (the sand is always neatly raked every morning when I walk by and trashed with little-person foot marks running in all directions when I pass in the evening), and a large, gorgeous red shrine with greenery around it. At the entrance to the Earthquake Research Institute building, I find my name on a touch-screen (easy to do because mine is one of two or three English names in a sea of Japanese kanji) and click it to indicate that I have arrived in the building. The screen is linked to a web site where others can log in to see if I have arrived so that they can come visit me. Usually, I am one of the first people in the building when I get there about 8:45 am (Japanese work very late, so they also start late). I head up the elevator and punch 6 when it asks me (in Japanese), "Which floor?" Talking elevators are a big thing here in Japan. Our elevator is very matter-of-fact and informal, but the elevator at Loraine's work is very polite and respectful in its use of formal Japanese (the difference between "Which floor?" and "If you would excuse me for not already knowing, please select which floor I might have the pleasure of taking you to." I get to my office, take off my shoes and switch to my office slippers. I walk across the room in my slippers, start my computer booting up and then draw the shades on my window so that I can begin my day of looking out over Tokyo. Over the last several years, I have had frightening combinations of metro + bus + walking in three different cities that were just shy of two hours each way. Even though it is ironic that I would move to Tokyo to get a shorter and easier commute (a city not known for either), I truly appreciate this commute! Alright, this is scary. Here it is more than ten days before Halloween, and I just came from the department store where they have just devoted an entire floor to Christmas decorations. I was there last week and it was filled with Halloween costumes and decor, but apparently the marketing department has moved on from that concept. Americans invented cars and digital watches, but you know where those industries are going now. Well watch out, Christmas, because the Japanese are taking ownership of that as well! See the department store's "Happy Christmas" announcement web site. Some of you may have noticed that the web site has been down on and off over the last few days. Sorry about that. You'll also notice that we've added a new feature: Comments! At the bottom of each entry, click on the "Comments" link and you can share stories of your own travels or just say hi. Give it a try! While L is busy at work each day, I take my weekends off. Today I went for a brief excursion to the area around Shinjuku station. My eventual target was extra coat hangers to dry our clothes on. I could have done that in our local neighborhood, but I wanted some adventure. Along the way, I decided to hit one of the hidden sites listed in our "Tokyo for Free" travel guidebook. Most of its entries are pretty mundane (local parks, shopping districts, etc. ), but there are a few gems that made it look like a worthwhile purchase (the book earns its keep after we visit just one free site instead of heading to the movie theater). Japan is well known for its cameras, so it follows that they must have some really good photographers. They have a very interesting institution here where the camera companies sponsor small galleries that are free to the public. They hold monthly competitions and local artists submit their photographs for entry. The winners picked by the camera company get a whole gallery to display their work for a week or two. I visited the Konica-Minolta gallery where this week they feature a fantastic set of photos of children by a Tokyo photographer (see a few photos from the show on their web page. The artist sits in the gallery all day long and answers questions, so there is a real sense of connection with the artists that you don't have at a lot of museums or gallery exhibitions. The camera company wins, the artist wins, and the public gets introduced to some great work. I definitely plan on exploring the other companies' galleries and returning to this one! L is happy to report that Hinode (pronounced "Hee-no-day"), her group's satellite, is alive and well. Hinode is the Japanese word for sunrise -- appropriate since it takes pictures of the sun. It passes over Japan about twice a day as it orbits high overhead, and someone has to be there to connect to it every time it passes during these first few weeks. It beams down a status report about things like its temperature, power, and other vital signs. They quickly try to analyze things to make sure nothing is wrong. The satellite is only in range for about 15 minutes, and some decisions need to be made after the satellite sends its status but before it disappears below the horizon like the setting sun. It's a stressful race against "sundown," especially when Hinode rise-to-set "day" is only 15 minutes instead of 24 hours. They spend the time in between passes making plans about what to tests to tell the satellite to perform next time it passes overhead. They are slowly asking it to do more and more tricks to make sure that everything is operating correctly. You may remember that the satellite takes pictures of the Sun, but they won't work up to operations that complex for another few weeks (we'll be sure to post the first new picture here when that happens!!). A previous solar satellite spun wildly out of control when its operators (people with jobs similar to L) were a bit hasty and accidentally sent a bad series of commands when the satellite was not ready. When you're dealing with a satellite that costs hundreds of millions of dollars, slow and steady definitely does win the race. You might be wondering, "how are those Japanese classes you took paying off?" After a little more than a month in Japan, we must report that we are not yet fluent. At times I feel like a native, able to navigate around shops and restaurants and fooling the waiters into thinking I speak fluent Japanese. And, at times, I feel like I am deaf, dumb, and illiterate -- thoroughly incapable of all forms of communication. Babies have come up with an effective coping strategy for being in this situation, though I don't think the other shoppers would take too well to me if I started bawling in the middle of the dairy aisle because I can't distinguish the cartons that contain low fat milk from the cartons of heavy cream. We eventually want to start Japanese lessons but have not had time to investigate the options yet. In the meantime, we're picking up bits and pieces as best we can. For example, there is a fruit and vegetable shop down the street. Each day, I take my bag and get two or three different items. As I pay, I hold up each item and the nice old lady says it for me in Japanese several times until I am able to repeat it correctly back to her. I now know my garlic from my green beans, but keep mixing up my spinach and my eggplant. One of my Japanese colleagues inquired while we were out at a restaurant, "when you are on your own, how do you decide what to order at a Japanese restaurant?" I replied that we have developed three strategies: 1) We are quickly learning the kanji for things that we do not like so that we can avoid them; 2) We do our homework. I frequently use my cell phone camera to snap photos of menus displayed outside local eateries. I then sit down with the kanji software on our computer and decipher the offerings. It can take as much as five minutes per menu item, so this is a very labor-intensive way to make selections; and 3) When feeling on the daring side, we simply randomly select menu items to find out what we get. To give you a flavor for what this is like, let me give you a demonstration. The photo above shows the menu of a small Japanese restaurant near our house. I have determined that they offer monkfish liver, foods topped with grated yam, squid with something related to salt (which is not very helpful because EVERYTHING here in Japan seems super-salty to me), turban shell something (could be raw snails as we've seen those once before), conger eel, and an item that translates as "investigate the wind from mountains." As you can see, the process is not entirely perfect. M is not the most open-minded eater in the world (he's not the pickiest, either), but he's slowly learning to let go. The sad part is that we think that our Japanese ability has actually degraded since we got to Japan. We're not alone in this thought -- we met someone at the synagogue who has lived in Japan for 9 years working at a Japanese law firm surrounded by native speakers, and he has less Japanese ability than we do after one summer school class. "How could this happen," you ask? In everyday life, we can get by with little actual conversation. Going to shops, one can survive on a few key phrases such as, "Do you have ___? ", "Excuse me", and "Thank you." English words are so readily adopted into Japanese that blank can often be replaced with the English word said with a Japanese accent. For example, I looked up the word for bread yeast before going to the store today. I asked the shopkeeper if he had any "koobo" (word in my dictionary). After a brief discussion with another person in the store, he returned to me and asked, "Yeasto?" A related story is of an American coworker that asked a Japanese person which of the many Japanese words for "thank you" would be most appropriate in a certain situation. The native speaker replied, "Oh, you can just say 'thank you.'" Wanting to expand his vocabulary, my coworker followed up, "No, I want to respond in Japanese." Japanese speaker: "'Thank you' IS Japanese now." North Korea announced that they performed an underground nuclear test this week. This is obviously bad news no matter what, but how can we verify that they are telling the truth? That's where seismology can help! Scientists here at the Earthquake Research Institute just sent out information about the North Korea nuclear test, as recorded by seismometers here in Japan. Take a peak at the seismograms here. Read more for a quick seismology lesson that explains what they mean. Here is a brief seismology lesson. Let's begin by looking at a regular, natural earthquake: Click here to view some example seismograms. Earthquakes are sudden releases of energy, a lot like explosions. The seismic waves they release travel through the earth and can be recorded by seismometers literally on the other side of the world. However, it takes time for the waves to travel this distance and some waves travel faster than others. 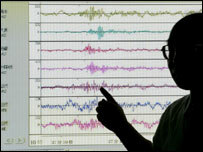 The example link above shows recordings of ground shaking from a number of different recording stations around the globe. Time starts at the bottom in these images and goes up. The line starts out straight at the bottom and then there there is a sudden increase in energy (p-wave) represented by wiggles on the seismogram. Almost all the lines then show a second, larger, burst of energy a few minutes later (further up on the plot). This comes from slower traveling s-waves. It's a lot like a running race where everyone starts at the sound of the gun, but they arrive at the finish line over a certain period of time because some of them travel faster than others. What are these waves and why are some slow and others fast? Different directions of motion generate different types of waves. Imagine that I am standing behind you with my hands out in front of me and resting on your shoulders while we do a conga line. I can move my arms such that you rock side-to-side, or I can push-and-pull you forward and back in the direction that we are walking. Earthquakes mostly involve "shear motion" caused by sliding along faults (side-to-side motion). Some of you may have seen me use my hands to demonstrate earthquake motion by having one hand slide past the other. Explosions, however, have very little shear energy and produce mostly forward and back blast-like motion. It's easy to imagine getting thrown backwards by the energy of a blast (and fun to demonstrate an explosion with your hands -- they fly apart rather than slide past one another). In an earthquake, you'd more-likely get thrown to the side (relative to the direction of where the earthquake is coming) because earthquakes involve more side-to-side motion. It turns out that the different directions of motion travel through rock at different speeds. I won't go into the reasons why. But this is why there are two main bursts of energy in earthquakes -- the faster forward-and-back motion called P-waves and the slower side-to-side motion called S-waves. It's important to remember that even though earthquakes have more energy in side-to-side motion, they release energy in BOTH both p and s waves. Why? Even though earthquakes are caused by side-to-side motion along faults, ruptures have ends and there is pushing or pulling near these endpoints that generates some back-and-forth wave motion. Let's take another look at the nuclear test seismograms. In these, time starts on the left and marches to the right. Each horizontal line is the recording at one location in Japan. Here, there is a lot of background noise before the blast energy arrives, so the line is not perfectly straight on the left side. Most of this background noise is caused by storms and ocean waves and is not actually related to earthquakes or explosions. All of the recordings show a single big increase when the first, fastest waves arrive. Which horizontal line is closest to the blast? The top one because the waves arrive at it sooner. While shaking continues for some time in these seismograms, there is NO second burst. That's because this was an explosion that had very little side-to-side energy, and therefore no s-waves. I've been in Japan about a month, but last week was my first official day of work at Tokyo University. L has been working hard almost every day since we've been here, but I have spent the time helping out with logistics related to our apartment and getting settled in a new country. It was raining torrentially during most of last week (something about a typhoon offshore), so I didn't get to enjoy the campus of Tokyo University very much. However, today, the sun is shining bright and I decided to explore the area and have a picnic lunch outside. It turns out that the University sits on the grounds of what was once a private residence of a very important person in the Tokyo government. Portions of the garden were preserved when they built the campus (in 1869, one year after UC Berkeley was established). The garden's central feature is a beautiful wooded area surrounding a large Japanese pond. Take a look at a few photos to see a snapshot of my "lunch buddy." My preschool had a praying mantis ("walking stick") when I was little, and I still vividly remember being fascinated by it. I have always had a soft spot in my heart for the bizarre looking creatures. They are so fragile looking, but at the same time, so cleverly disguised. I think I might have seen one in the wild once before, but it was a fantastic treat when this one joined me during my lunch. She was about 10 cm long (4 inches). After eating, I walked the edge of the pond, watching the turtles, the massive fish, and a beautiful waterfall. Not a bad break in the middle of the day! ** There is a small chance that you will need to cut off the leading zero in our cell phone numbers so that they would be 80-3448-5752 and 90-6569-9964. Give that a try if you have problems reaching us on the cell phone. At the end of several important Jewish holidays, it is customary to say, "Next year in Jerusalem" to indicate that we hope to celebrate the holiday in the Holy Land next year. We didn't quite make it to Israel this year, but it turns out that Japan is actually a bit closer than America, at least geographically speaking! Autumn brings the most important holidays of the Jewish calendar -- the Jewish New Year. There are two main holidays spaced ten days apart: Rosh hashanah and Yom kippur. The first one marks the beginning of the new year and the beginning of ten important days for reflection. My favorite ceremony is where we symbolically cast off our sins by dropping breadcrumbs into moving water. It's also important to seek forgiveness from all of the people that you might have wronged during the last year. The final day in the cycle is Yom kippur, the day of atonement. It's a day of fasting and sincere prayer that culminates when God symbolically seals each person's name in the Book of Life so that they will live and thrive for another year. These holidays are so important that people from around the world try to find a way to celebrate the holiday with their local Jewish community. Not only is there a synagogue in Tokyo, but it's actually pretty thriving. Because we just moved to Tokyo, we had not made reservations for the service. That left us in the "standing room only section," which should give you an idea of the crowd. Well, was the experience like home? On both the inside and outside, it looks just like an American synagogue. Most of the people were American -- lots of families with kids. The rabbi even had a distinctive Brooklyn accent. There were, however, a handful of Japanese people there. The synagogue seems to have a steady population of Japanese people that have married Jews and have formally converted to Judaism. That made for an interesting, slightly more diverse crowd. Also interesting was that the Israeli ambassador to Japan spoke a few words about the relationship between the two countries. He said that his goal was to make the Japan-Israel relationship more similar to the US-Israel relationship. Both Israel and Japan are hotbeds of high technology, but they also share some interesting relationships culturally. A humerous comparison he made was that almost every small town in Israel teaches Japanese martial arts in their community centers. He himself is a judo instructor. Overall, it was another crazy experience finding an island of the familiar in a sea of difference.